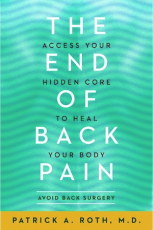 Free Yourself from Back Pain Without Surgery! Back pain sometimes has little to do with the back. Pain medications can cause more pain. Weight loss does not improve back pain. You know your body best. That makes you smarter than your doctor. The back-strengthening program goes far beyond traditional abdominal core work to strategically target your "hidden core," including all the vital front, side, and back muscles that line, stabilize, and support the spine. Dr. Roth empowers your body and mind to remarkably decrease the frequency, intensity, and duration of back pain, giving you true and lasting relief.